I love to cook. I not only love to cook, I love to read about cooking and food. I love cookbooks and cooking magazines. I have hundreds of cookbooks and subscribe to several cooking magazines. I have folders filled with favorite recipes that I have tried and recipes I have pulled from magazines and books that I plan to try, so many in fact, I should start a project like my "1001 Movies I Must See Before I Die Project," and call it "My 1001 Recipes I Will Probably Never Get Around To Trying Before I Die Project." But just because I love to cook, doesn't mean I am any good at it. Just ask my son. I used to say that "If you can read, you can cook," as in follow the recipe and all will be well. But that's not always the case. Sometimes I am successful and sometimes I am not. And sometimes I don't follow the recipe, because I think I am a good enough cook to substitute ingredients. Again, sometimes I am successful and sometimes I am not. But success or failure, I don't give up because, like I said, I love to cook. I keep collecting the recipes and preparing them in my "test kitchen," so I can try them. And here's the rub. Usually that's all I do...try them, I mean. I want to see what the recipe tastes like and then, when I do, I move on to another recipe. And I have so many recipes to try that I usually prepare two or three of them every weekend, which results in lots and lots of left-overs which then results in Hubby looking in the fridge and yelling, "Cripes! Who is going to eat all of this food?" to which I reply, "You." Hubby is my guinea pig, so don't be surprised if he weighs in from time to time. 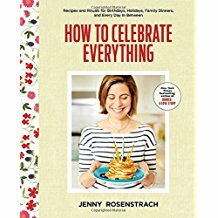 So since cooking and reading about cooking is a big part of my life, even though I can't say I am always a successful cook, I thought it was a natural progression for Rosy the Reviewer to not only review movies and books but recipes as well and to let you follow me along with my successes and failures. 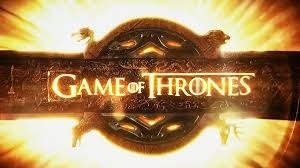 I am still primarily a reviewer of movies and books, but from time to time on this blog, I will share with you my thoughts and observations as I experiment in my kitchen. I will "review" the recipes and share what I liked about the recipe, what I didn't like, what I learned and whether or not I was successful, as in will I prepare this recipe again? Hopefully you will want to try some of these recipes yourself or I can steer you clear of some that didn't turn out so well, and I will share some tips along the way that will be useful to you as you work in your own "test kitchen." And most of all, I hope we can have some fun too! So this is Post #1, in what I hope will be a recurring part of Rosy the Reviewer, as I review the new recipes I come across. This week, I will be sharing with you whether or not I was successful preparing "Mango Peanut Curry" from Clean Eating Magazine, Tia Mowry's favorite Chicken Noodle Soup published in the March 20, 2017 issue of "People Magazine," and "Crowd-Pleaser Summer Slaw" from the book "How to Celebrate Everything: Recipes and Rituals for Birthday, Holidays, Family Dinners and Every Day in Between" by Jenny Rosenstrach. I will also share what I learned. I just started subscribing to "Clean Eating" magazine and I have come to the conclusion that "clean eating" means mostly vegetarian. I am not a vegetarian, but hey, I am into a good dish whether it contains meat or not, and I am always on the look out for good vegetarian dishes because my daughter and her husband are vegetarians. 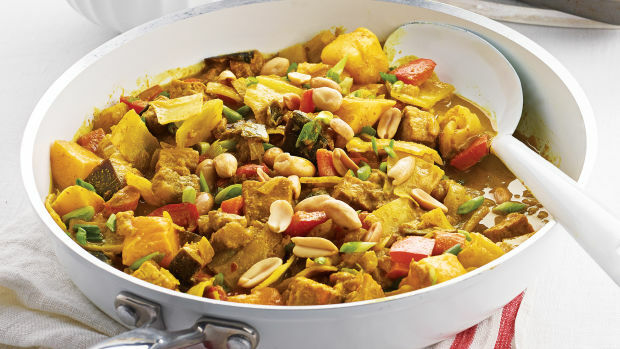 I am also especially fond of curries, so I thought I would give this one a try. This is basically a vegetarian dish using tofu instead of meat and has all kinds of veggies like eggplant, bell peppers and cabbage in it. I could use up many fresh ingredients I had languishing in the crisper in my fridge. You could easily substitute or add other veggies that are not specifically mentioned in the recipe. Peeling fresh ginger. Hate that. Too many ingredients. Hate that. It's hard to find fresh mangoes. Also right in the middle of fixing the recipe, I realized I didn't have any peanuts on hand. Hate that too. But do you ever get half-way through a recipe only to discover that you don't have that ingredient you were sure you had? What to do? Why you yell, "Hubby, I need you to go to the store!" Works every time. The dish seemed bland and mushy. However, I think I overcooked the tofu. You might have better luck. You can make a curry without using curry powder, though I think I prefer the curry powder. Here you are basically making curry powder with the turmeric, cumin, ginger and coriander. But why do that when you can just grab curry powder from your spice rack? I will go for one ingredient over four every time. Probably shouldn't have decided to go off script and use a handful of coleslaw mix instead of the green cabbage I was supposed to chop. If you can't find fresh mangoes, you can find frozen mangoes in the freezer section at the supermarket. You do not need to peel an eggplant unless it's a very big one with tough skin. The skin is perfectly edible if you like that kind of thing. However, I learned that I don't like eggplant. Serve the curry over rice. Rice makes everything better. And what is successful every time is my baked rice recipe which I now use almost exclusively when preparing rice. No more rice burned on the bottom of the pan, no more mushy rice and easy clean up when I use my little le crueset pot. Not sure where I got this recipe. Believe it of not, it might be from Dean McDermott's "Gourmet Dad" cookbook (you know, Tori Spelling's husband? He used to host "Chopped Canada" and now how has own Gourmet Dad website). But I'm not sure. Anyway, once I discovered this recipe, it's my go to. 2. In a medium ovenproof saucepan bring 2 and a half cups of water to a boil. Add a tablespoon of oil and a teaspoon of salt. 3. As soon as the water starts to boil, pour in 1 and a half cups of long-grain rice (I like jasmine rice) or whatever rice you like. Put a lid on it and pop it in the preheated oven. 4. Let it bake for 18 minutes if you are using white rice, an hour for brown. I haven't tried it with the brown rice so proceed at your own risk. 5. Take it out of the oven, let it stand for a couple of minutes and then stir. Tip: If you oven is like mine, it takes forever to heat so I recommend heating your oven first and when it's ready, then heat the water so you don't have your water boiling and you are still waiting for the oven to heat up. You can also substitute chicken stock for the water and add whatever seasonings you would like. Works perfectly every time. Even I can't screw that up! I am always on the look out for the perfect chicken noodle soup recipe. Nothing is more soothing and edible and this one used spaghetti noodles so I was intrigued (click on the link above for the entire recipe). The soup uses chicken thighs which is my favorite chicken part. It uses spaghetti for the noodles, which I thought was interesting and so I wanted to try that. I don't like making my own stock. I never have good luck with it and end up with a soup where I have to scrape off the fat and I never get it all. Then the broth tastes greasy. Why make your own soup when you've got Grandma Swanson on your side? The recipe should have called for peas. There was not enough broth, the soup tasted greasy and the spaghetti didn't hold up well when reheating. Spaghetti noodles don't hold up well as soup leftovers. They get very gummy. 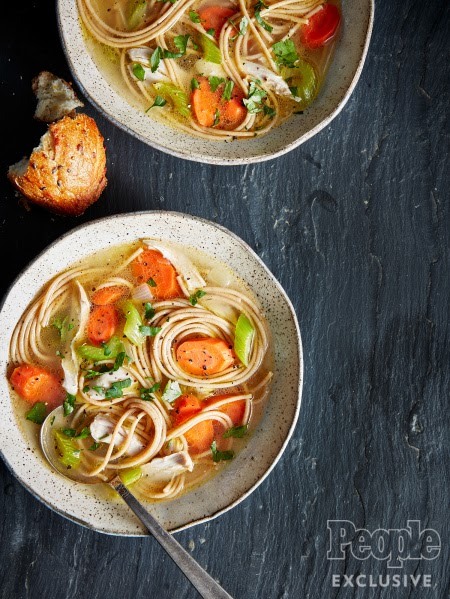 I already have the perfect chicken noodle soup recipe and it is one of my own creation. I learned who Tina Mowry was - I didn't really know. So far, here is my favorite chicken noodle soup recipe. "Rosy the Reviewer's Chicken Noodle Soup"
Add at least 10 cups of chicken broth. You can make your own stock, but I ask, why? Mrs. Swanson has already made it for you! Once you get the stock and the veggies boiling, put in the noodles. The absolute best noodles for chicken noodle soup are the Country Pasta egg noodles (Homemade Style Egg Pasta) made by Country Foods and available at Costco. They are just like homemade and take about 20 minutes to cook in the broth but they are perfect. Just don't throw in too many. I like a small ratio of noodles to broth but do what you want. It's your soup. That's the beauty of chicken noodle soup. You can make it to your taste. Throw in some rotisserie chicken (Again, Costco has by far the best and largest rotisserie chickens for the best price) or chicken left-overs. And here is the secret to great chicken noodle soup: peas, dill and a little fresh lemon juice. Tip: If you enjoy the broth, and I do, I mean, isn't the broth the whole point? I always increase the amount of stock called for. In my opinion, soup recipes that include noodles never include enough broth. Who knew from a little girl whose idea of a salad was plain iceberg lettuce? But I have grown since then. Slaw is one of those things that's good on everything. I think it's the mayo. Put some slaw on a sandwich and I am in heaven so I am always drawn to new slaw recipes. (Since I couldn't find this recipe online for free, I am including it in its entirely below. You can also find this book on Amazon or check it out at your library). Whisk together the dressing ingredients, add to the salad and toss. I am crazy about slaw and Asian flavors and I love anything with cilantro! Mandolins - they are too scary. You can slice off a finger. That's why I actually ended up picking out some red cabbage from one of those premixed salads and substituted a premixed bag of slaw. Probably shouldn't have done that. The slaw eschewed mayo which is fine. She was going for an Asian taste here, which I get, but it was just too vinegary and I am definitely a mayo girl when it comes to my slaw. It was bland and too vinegary, though Hubby said it got better after sitting in the fridge for awhile. But after it sat in the fridge for a day or two, the red cabbage ran all over the salad which made it look like a murder scene in a horror film. I already know how to make my favorite slaw so if it's not broke, don't fix it. I also learned that I need to quit adding new slaw recipes to my gigantic folder of recipes to try. (For the full recipes for the curry and the chicken noodle soup, just click on the links above). "Rosy's Test Kitchen" will be an intermittent part of this blog. 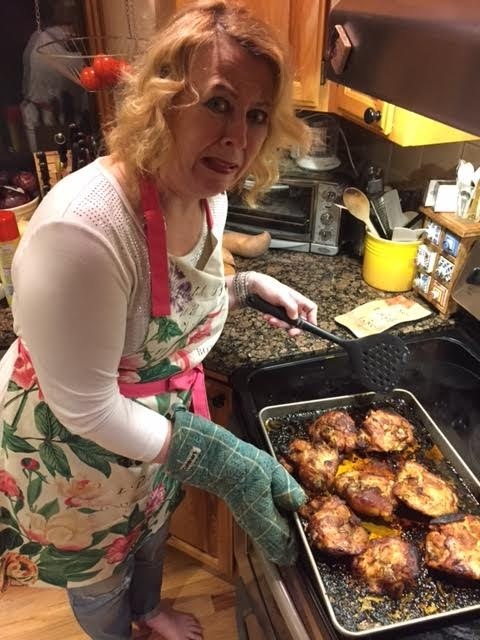 See you next time for installment #2, where I will share some favorite recipes: my favorite chicken recipe, my favorite fudge recipe and my favorite lettuce wrap recipe, all of which even I can't screw up! It's back to movies and books! Love Rosy's Test Kitchen! Keep testing! BTW, you ARE a good cook! Thanks, "Scout," I will keep testing, but you have it all over me! Three test recipes, all marked Not Successful. Verdict? The tried and true family recipes you've been making forever are favorites for a reason. Stick with them. I'm glad you are our test cook, but you have confirmed my thoughts - go with what you know in the kitchen. My mother used to always try new recipes, and some of them did turn out pretty good. She would always ask us what we thought, and even if we DID say we liked it she would always say, "It was ok, but I don't think I'll make it again." Stay tuned for my next one. I am doing some comfort food favorites that even I can't screw up. I am also like your mother - I try the recipe and often don't plan to make it again. Unfortunately, I also have a folder of recipes I have clipped out of magazines that I DO plan to make again but I have so many I wonder if I will ever get around to them again!